It specializes in the more obscure altcoins on the market and it brands itself as “The People’s Exchange.” Meet KuCoin, a rising star on the cryptocurrency exchange field. It’s one of the younger exchanges out there. Launched on September 15th, 2017, the Hong Kong based exchange has had a successful inauguration. Many in the crypto community have drawn comparisons to Binance, and at time of writing, the exchange is ranked #17 on CoinMarketCap in 24/hr volume at $303mln. Offering its own coin and shared trading profits among its users, KuCoin is unique in its own right amongst its peers, and it’s worth getting to know at the very least. So let’s get acquainted, shall we? KuCoin has one of the quickest, least painful account set up and verification processes out there. All you need to do is head over to the exchange’s website, click “Sign up,” and enter an account email and password. From here, you’ll need to verify your account via email, and viola, you’re done! Seriously, it’s actually that easy. Oh yeah, you also need to enable two factor authentication before you can start trading, either through Google (if you’re not from China) or through SMS (for Chinese residence). Unlike most exchanges, there are no tiers to verification status, so all accounts from their creation are treated equally. Trading pairs on KuCoin are exclusive to cryptocurrencies, so deposits onto the platform depend entirely on the network speed of the currency in question. For withdrawals, anything that is less than 100,000 times that coin’s withdrawal fee will be processed in seconds. If you’re withdrawing Ethereum, for example, your transaction would clear nearly instantly so long as it was less than 1,000 ETH (if you’ve got more than that on the exchange, for the love of Mary, man, get that into a wallet quick!). Currently, KuCoin has no withdrawal limits, an unusual departure from the procedures most exchanges follow. Now, before you start throwing your hands in the air in celebration, the team is looking to adding a daily limit of 2 BTC sometime in the near future. Perhaps one of the likeliest comparisons we can draw between Binance and KuCoin come from the low fees both exchanges offer. Like Binance, it has a flat 0.1% fee for all trades. 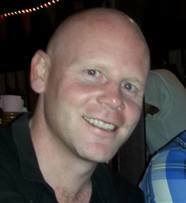 This fee will be taken out of the asset that is purchased, not sold. There are no fees for depositing onto KuCoin, but as with most exchanges, the withdrawal fees vary. For example, Ethereum runs at 0.01 ETH, Litecoin at 0.001 LTC, and Bitcoin at 0.0005 BTC. In the KuCoin whitepaper, the exchange’s team goes to lengths to detail KuCoin’s security measures. These standards meet modern financial and banking-level criteria. Micro-wallets (those used by accounts for withdrawals), are stored in a private network built on Amazon Web’s Cloud Service, protected by a multi-layered firewall. Documentation of these wallets are encrypted and require two individuals to decipher the code simultaneously to unlock it. Further, macro-wallets (those used by the exchange for reserve funds) are held in cold wallets under the protection of banking storage. Finally, encryption and multi-factor authentication protects all of the data stored on the platform. Users have the choice of two factor authentication to keep individual accounts safe, as well. 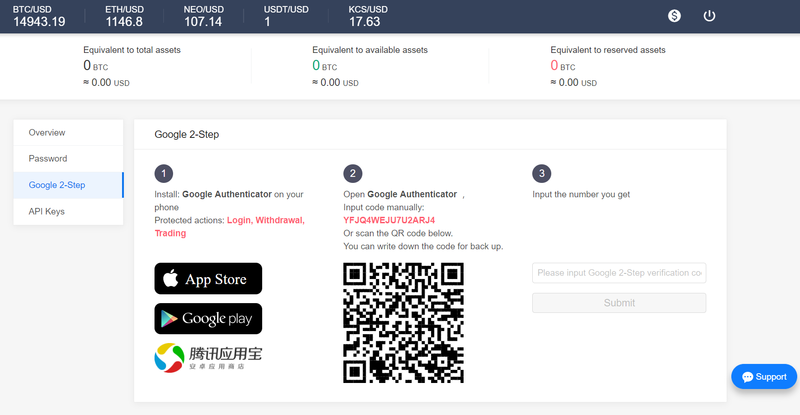 Going along with its easy-going registration, KuCoin serves up a truly ease-of use interface. Anyone from longtime investors to newbies are likely to find its design straightforward and its functions easy to navigate. In its market view, KuCoin offers tabs off all of its trading pairs. From here, investors can easily navigate markets for the trading pairs they’re looking for, either manually or with the exchange’s search bar in the top right of the market view. Once you’re in the trading window, the exchange function is about what you would expect. It includes an order book, depth chart, price chart, and a log for an individual’s active or past orders, along with the usual chart reading tools veteran traders use to go to work. 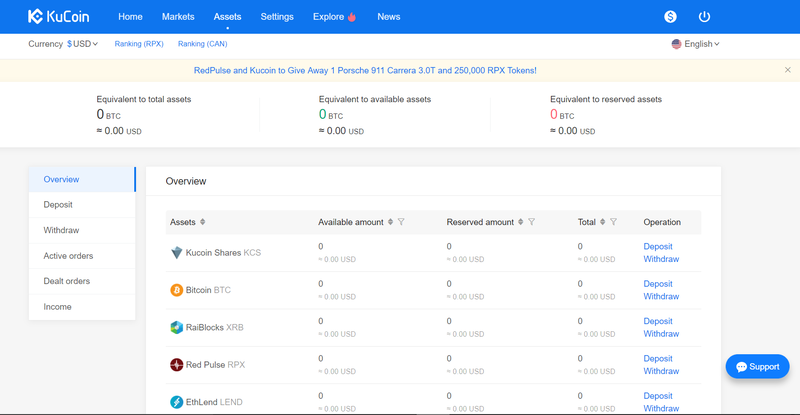 In KuCoin’s asset section, you can keep track of all of your funds, orders, and income (returns) all in one place. If you’re having issues with your experience, you can contact KuCoin at support@kucoin.com or on the instant message help chat featured on the exchange’s website. Alternatively, KuCoin has its own subreddit, and developers can be reached via the KuCoin Telegram, as well. Adding to the comparisons to Binance, KuCoin sports its own native currency, KuCoin Shares. Like Binance coin, KuCoin Shares have their own trading pairs, but unlike its cousin currency, KuCoin Shares don’t offer trading discounts. Instead, they offer holders a share of KuCoin’s trading fees. Yes, you read that right. 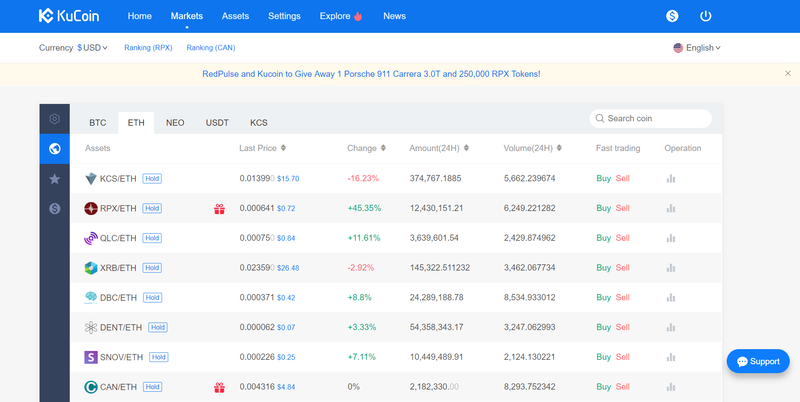 If you own KuCoin, a portion of 40% of the exchange’s daily fees will go to you based on how many KuCoin Shares you own. If you refer a friend to KuCoin, you’ll get 50% of that friend’s trading fees. These fees are paid in the traded currency in question. KuCoin also supports a highly scalable ordering system, capable of handling 2 million placed orders per second as well as 1 million processed orders per second. It also has API plugins to allow for trading bots. As I mentioned in the introduction, KuCoin is rising fast in the cryptocurrency community, becoming one of the hottest exchanges available. With its innovative fee sharing model with native KuCoin Shares currency, it’s also unique in that it offers the only profit sharing with its customers of any exchange available. It also has an impressive team full of industry leaders, including CEO Michael Gan, former technical expert of the Alibaba Group’s Ant Financial. When we consider KuCoin’s team and their dedication to providing a superior exchange experience, the exchange’s low fees, and its innovative approach to profit sharing, we’re chalking up KuCoin as one of our honorable mentions going into 2018.